A traditional, formal presentation of the bride price at a Thai engagement ceremony. Bride price, also known as bride wealth, is an amount of money, property or other form of wealth "paid" to the parents of a woman for the right to marry their daughter. In anthropological literature bride price has often been explained in market terms, as payment made in "exchange" for the bride's family's loss of her labor and fertility within her kinship group. It may also be understood as a gift from the groom to his new bride's family. In this sense it is a substantial gesture of goodwill in the forging of the new unity of the lineages. Unfortunately, the voluntary nature of gift-giving in the case of bride price has often been lost as the practice became a requirement for marriage, a requirement that has often proved burdensome. Bride price or bride wealth is money, property, or wealth "paid" to the parents of a woman for the right to marry their daughter. This is often confused with dowry, which is paid to the groom, or used by the bride to help establish the new household, and dower, which is property settled on the bride by the groom at the time of marriage. The same culture may simultaneously practice both dowry and bride price. The practice of bride price may include brideservice, the service rendered to the bride’s family by the bridegroom as the brideprice or part of thereof. A famous example of brideservice occurs in the Book of Genesis, when Jacob labors for Laban for seven years to win Leah and another seven years to win Rachel. a man who paid the bride price but looked for another bride was not entitled to the return of it, but if it was the father of the bride who refused the match, he was. if a wife died without sons, her father was entitled to the return of her dowry, minus the value of the bride price. In the Jewish tradition, the rabbis in ancient times insisted on the marriage couple entering into a marriage contact, called a ketubah. Besides other things, the ketubah provided for an amount to be paid by the husband in the event of a divorce or by his estate in the event of his death. This amount was a replacement of the biblical dower or bride price, which was payable at the time of the marriage by the groom. This innovation was put in place because the bride price created a major social problem: many young prospective husbands could not raise the amount at the time when they would normally be expected to marry. To enable these young men to marry, the rabbis, in effect, delayed the time that the amount would be payable to later when they would be more likely to have the sum. Another function performed by the ketubah amount was to provide a disincentive for the husband contemplating divorcing his wife: he would need to have the amount to be able to pay to the wife. They are too craven to go to the house of her father Icarus, that he may himself set the bride-price for his daughter, and bestow her on whom he will, even on him who finds favor in his sight. The custom lasted into classical times, by which time it had been become merely a token, less valuable than the bride's dowry. The absence of bride price in classical times distinguished the Greco-Roman society from their contemporary Indo-European peoples, such as the Celts, as well as from the ancient Mediterranean societies. In Chinese culture, an auspicious date is selected to Ti Qin (literally meaning "propose marriage"), where both families meet to discuss the amount of the bride price demanded, among other things. A couple of weeks before the actual wedding, the ritual of Guo Da Li (literally meaning "performing the rites") takes place (also on an auspicious date). The groom and a matchmaker visit the bride's family bearing gifts such as wedding cakes, sweetmeats, and jewelry as well as the bride price. On the actual wedding day, the bride's family return a portion of the bride price (sometimes in the form of dowry) as a goodwill gesture. The practice of bride price also existed in India. It occurred primarily in the lower castes, and many families had a very hard time to have the means to provide for their daughters. It was virtually eliminated in the early twentieth century. In parts of Africa the validity of a traditional marriage ceremony depends on the payment of a bride price, which can vary from a token amount to exorbitant figures. A similar tradition to the bride price is the Morgengabe ("Morning gifts") of medieval Germans, paid by the groom or his family to the bride. The name derives from the Germanic tribal custom of giving them to the bride the morning after the wedding night. The purpose was to secure the bride for widowhood, loss of other means of survival, or loss of other property. Together the Morgengabe and dowry worked to give a start in life to a young couple, and secure the bride's future. Morning gifts were preserved for many centuries in morganatic marriage, a union where the wife's inferior social status was held to prohibit her children from inheriting a noble's titles or estates. In this case, the morning gift would support the wife and children. Mahr (Arabic) is a similar tradition in Islamic marriage. It is paid (or promised to be paid in case of divorce) by the groom to the bride (as opposed to the bride's father). It is mandatory. Lobola (Mahadi in Sesotho), is a similar tradition in southern Africa. Sometimes translated as bride-price, Lobola is a traditional southern African dowry custom whereby the man pays the family of his fiancée for her hand in marriage. The custom is aimed at bringing the two families together, fostering mutual respect, and indicating that the man is capable of supporting his wife financially and emotionally. The process of Lobola negotiations can be long and complex, and involves many members from both the bride's and the groom's extended families. Often, to dispel any tensions between the families, a bottle of brandy is placed on the table. This is usually not drunk; it is simply a gesture to welcome the guest family and make everyone feel more relaxed (it is known as mvulamlomo, which is Xhosa for "mouth opener"). The tradition of paying a bride price is still practiced in many Asian countries. However, the actual amount changing hands is more of a token for the purpose of continuing the traditional ritual then an actual price-tag attached to the bride-to-be for marriage. In Thailand, bride price (locally known as sin sot, and often erroneously referred to by the English term "dowry") is still extremely common. The bride price may range from nothing, if the woman is divorced, has a child fathered by another man, or is widely known to have had premarital relations with many men; to ten million Thai Baht (US$300,000) or more for a woman of high social standing, a beauty queen, or a highly educated woman. The sin sot is paid at the engagement ceremony, and consists of three elements: cash, Thai (96.5 percent pure) gold, and the traditional diamond ring. The most commonly stated rationale for the bride price in Thailand is that it allows the groom to demonstrate that he has enough financial resources to support the bride (and possibly her family) after the wedding. 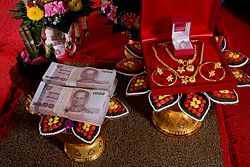 In many cases, especially when the amount is large, the parents of a Thai bride will return all or part of the money to the couple in the form of a wedding gift following the engagement ceremony. In contemporary Africa, with a declining economy and a change to a more urban environment, the bride price seems to function like a pension for aged parents. However, it has become very controversial with modernization in many parts of Africa. Some argue that it is good social policy, while others believe it encourages a slavery type situation. In South Africa, traditionally the Lobola payment was in cattle, which were the primary source of wealth in African society. However, most modern urban couples have changed to cash. Like other bride price situations, Lobola has numerous unintended negative side-effects. It has created a financial barrier to entry for young men looking to take a bride. It is commonplace for a couple that is emotionally ready to commit to building a life together to stay unmarried if they do not have the financial resources to satisfy the impeding traditional ritual. Lobola is seen by some as an extravagance that has little relevance in a society where young Africans are trying to lift themselves out of inherited poverty. Young men who are in the wealth-creation stage of life feel their future is better served if they invest their money elsewhere to receive significant financial returns. The payment of bride price by men for their wives as demanded by custom leads men to treat their wives as near possessions from whom maximum obedience is extracted. Whereas young men and their families have to work hard to accumulate the wealth necessary to pay bride price, women, especially widows become vulnerable in the face of relatives who want to take away their husbands property and leave them with no support. Girls are married off early to raise income for the family. Refund of bride price does not take into account the contribution of the woman to the marriage, the children she has produced and the products of her labor. As a result of MIFUMI's work, the Tororo district council in Uganda passed an ordinance in 2008 determining that bride price should become a bridal gift, and as such is non-refundable. A famous Telugu play Kanyasulkam (Bride Price) satirized the practice of bride price and the Brahmin notions that kept it alive. A book entitled The Bride Price by Nigerian woman Buchi Emecheta has also gained some popularity, and tells a very human and trans-cultural tale about maintaining identity. Abdullah, Amatullah. 2005. The Bride Price: Dowry Abuse. Islam Online, November 28, 2005. Retrieved May 19, 2009. Beaumont, Peter. 2007. Starving Afghans sell girls of eight as brides. The Observer, January 7, 2007. Retrieved May 19, 2009. Birodkar, Sudheer. 1998. Hindu Social Customs - Dowry, Sati and Child Marriage, Hindu History: A Search for Our Present in History. Hindu Books Universe. Retrieved May 19, 2009. China Bridal. 2003. Complete Guide to Chinese Wedding. ChinaBridal.com. Retrieved May 19, 2009. IRIN. 2007. Zimbabwe: Daughters fetch high prices as brides. IRIN, July 17, 2007. Retrieved May 19, 2009. Jain, Laika. 2003. When brides become scarce SikhSpectrum.com Monthly, No. 9, February. Retrieved May 19, 2009. MIFUMI. 2008. Tororo District passes the ordinance Bill 2008 on Bride Price. MIFUMI Newsletter. Retrieved May 19, 2009. Williams, Benecia L. 1997. Buchi Emecheta. Retrieved May 19, 2009. This page was last modified on 12 June 2009, at 12:34.